to enhance your leadership influence. More important than flipping in-person lectures for online lectures, professors need to consider how they can flip the instructional focus and emphasis learning ahead of teaching. Videos are a widely-used kind of resource for online learning. This paper presents an empirical study of how video production decisions affect student engagement in online educational videos. To our knowledge, ours is the largest-scale study of video engagement to date, using data from 6.9 million video watching sessions across four courses on the edX MOOC platform. We measure engagement by how long students are watching each video, and whether they attempt to answer post-video assessment problems. Our main findings are that shorter videos are much more engaging, that informal talking-head videos are more engaging, that Khan-style tablet drawings are more engaging, that even high-quality pre-recorded classroom lectures might not make for engaging online videos, and that students engage differently with lecture and tutorial videos. What's an inverted classroom? Just ask students in some University of Toronto computer science courses. The teaching method flips traditional notions of classwork and homework so that students learn some of the course material through videos and readings at home and do what used to be homework in class with the help of their professor. Instead of a traditional three-hour lecture, the professor prepares online video lectures, slide shows of core content and quizzes for students to work on before class – hence the flip. Once in class, the professor reviews knowledge gaps revealed by the quizzes, leaves time for students to work together on problems and delivers the occasional short lecture to reinforce a concept. The flipped classroom does not automatically provide those sorts of outstanding learning experiences. What it provides is space and time for instructors to design learning activities and then carry them out, by relocating the transfer of information to outside the classroom. But then the instructor has the responsibility of using that space and time effectively. Fast-forward two years, and the predictions about the disruptive effect MOOCs would have on traditional colleges and universities have, so far, been overblown. But with two years of experience under their belts, MOOC providers and users are adjusting both their perceptions about online learning and the courses themselves. Here are 10 lessons they’ve learned. Blended learning is a fast (if not the fastest) growing delivery and instructional design method in colleges and universities. As faculty, you can use blended learning to encourage more engaged and interactive learning for your students. After defining and outlining some of the benefits and challenges of blended learning, we offer examples of ways blended learning has been used effectively in colleges and universities in Ontario. Remembering: can the student recall or remember the information? Understanding: can the student explain ideas or concepts? Applying: can the student use the information in a new way? Choose, demonstrate, dramatize, employ, illustrate, interpret, operate, schedule, sketch, solve, use, write. Analyzing: can the student distinguish between the different parts? Appraise, compare, contrast, criticize, differentiate, discriminate, distinguish, examine, experiment, question, test. Evaluating: can the student justify a stand or decision? Creating: can the student create new product or point of view? Assemble, construct, create, design, develop, formulate, write. 1. Don't be an Egghead: No one wants to follow an egghead. 2. Share Information and Retweet: Don't just lurk or promote yourself, share ideas and links to resources. Retweet the information that you find valuable. Make sure you have a good ratio of tweets and retweets. Nobody wants to follow your never ending monologue. Just like in kindergarten, you need to listen and share if you want to make friends. 3. 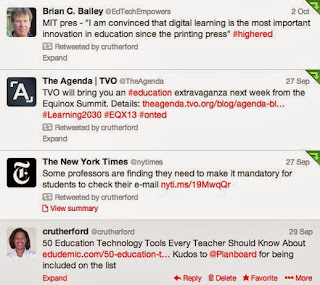 Know your Audience: If you want to use Twitter as a professional learning network, only post information that is relevant to your professional life. The occasional goofy picture is fine, but create a personal account if you have the urge to share your beer can collection or LOL cat fascination. Sharing relevant professional information that highlights your professional interest or expertise will facilitate the development of an active learning community that will support your professional growth. 4. Use #Hashtags to Avoid Being Overwhelmed: Your Twitter page can look like a fast moving springtime creek once you start following more than a hundred people. Searching by #hashtags can make it easier to find the information you want. 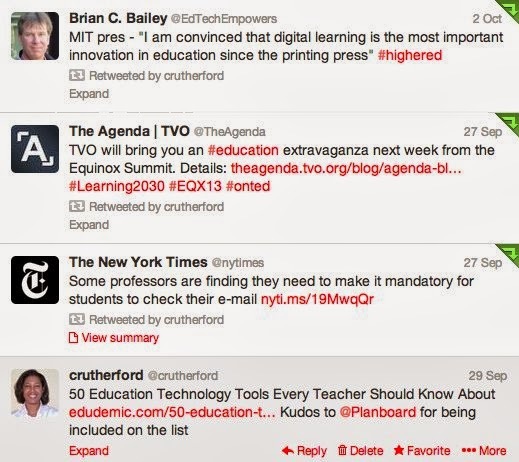 A Twitter list is a curated list of Twitter users that you can create or subscribe to. Once the list has been created you can view the Tweets just from the people on the list. 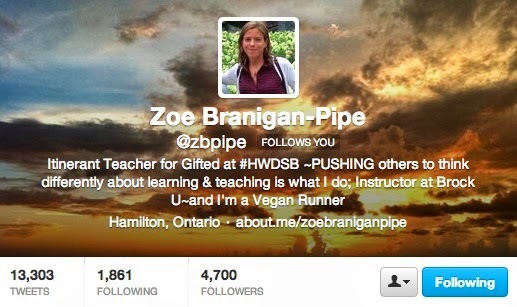 This is a great way to follow the Tweets of people from your school, district, or educational speciality. #Hashtags enable you to search the Twitterverse to find Tweets related to a specific topic. Searching by #hashtags is the most efficient way to find educational resources. Use the guides listed below to find the #hashtag for what you are looking for. 5. Follow the Teachers, School Leaders or School Districts You Would Like to Work With: The quality of your Twitter experience will depend on who you follow. Be sure to follow the school district you would like to work for or where you will complete your practicum. This will ensure that you are informed about current district initiatives. Reviewing the people the district account follows is a quick way to find the Twitter accounts for teachers, principals, schools and school leaders that work within the district. They may even have a Twitter list that makes it even easier to find district schools or employees. In addition to following your colleagues and the organization you work for be sure to follow some of the most active Canadian educators on Twitter. 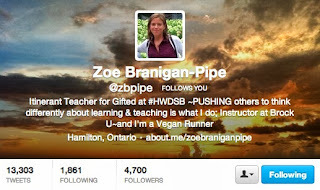 The large number of followers these educators have amassed is a result of their exemplary use of Twitter. Following these leading Tweeters will give you a diverse offering of perspectives and resources. Following just people you already know will result in a echo chamber that fails to provide you with new ideas or opinions. The District School Board of Niagara and Brock University’s Faculty of Education are collaborating on a unique initiative to support innovation in Canadian education and technology. When the Hub officially opens its doors in late February, it will be a home to several original start-up companies. The collaborative atmosphere of the Hub will promote discussion, idea sharing and creativity amongst educators, researchers, graduate students, entrepreneurs and education technology companies. Dr. Fiona Blaikie, Professor and Dean of the Faculty of Education at Brock University, believes that the Hub is an example of how 21st century research should take place. Dr. Camille Rutherford, Associate Professor in the Department of Teacher Education, acknowledges that there needs to be a direct line from invention to practice. The Hub aims to eliminate the disconnect between educational insight and the innovation process. It will bridge this gap by providing entrepreneurs with the opportunity to observe actual classes and the strategies teachers use to support student learning. Start-ups will also be able to refine their products by observing their use in an actual classroom setting. This will allow companies to make necessary enhancements to ensure they are best meeting the needs of students, teachers and schools. In addition to the benefits the Hub will bring to the product development process, students will also benefit from their interactions with these start-up companies. “Students will have safe access to programmers, engineers and entrepreneurs, giving them the ability to ask questions, share ideas and learn more about potential career paths,” says Dino Miele, DSBN Chief Information Officer. Located within the DSBN Academy at 130 Louth Street in St. Catharines, the Hub is unique in its location. “There are a number of EdTech incubators and accelerators throughout North America, but there has yet to be a location that is housed within a K-12 educational institution,” says Rutherford. Despite Orlando's unusually cool and wet weather, the Florida Educational Technology Conference should be considered one of the best values when it comes to EdTech events. Here are the top five reasons why it is the place to be. It's in Orlando in January - For Canadians or anyone from a cold climate that may be the only argument needed. Despite the chill in the air this year, it was a nice escape from the polar vortex gripping the northern half of the continent. At the Mindshare Learning Canadian Tweetup (There were over 300 Canadians at FETC this year) the prize for the coldest hometown went an educator from Saskatchewan who was happy to be avoiding the -44 weather back home. Price - The FETC walk-up registration price (No membership needed) was $290. There were a number of online discounts that brought the cost down to $230 if you didn't register in time to take advantage of the early bird pricing. In contrast the ISTE walk-up registration fee for non-members is $448. Sometimes smaller is better - With 8, 500 attendees, FETC is less than half the size of ISTE with is over 18,000 attendees. This can make FETC less overwhelming and exhausting. Despite the smaller size, most of the rock star presenters and technology companies listed on the ISTE website are also at FETC. A review of the conference agendas with reveal a number of commonalities when it comes to presentation speakers and topics. Regardless of the smaller size, FETC provides excellent professional development opportunities. Travel - Flying into ISTE's various conference locations presents attendees with a roller coaster of airfare research each year. With Orlando as FETC's permanent location, developing a budget for getting to FETC is considerably easier. As a vacation destination, there are plenty of flights and routes to choose from and late January also provides many off-season travel deals, making it easy and affordable to get to FETC each year. Accommodations - As a vacation resort mecca, Orlando is a very budget friendly location. I've had the pleasure of staying at the Vista Cay Resort for the past two years. This resort includes condo and townhouse accommodations that permit small and large groups to stay within walking distance of the convention centre for less than the cost of a hotel room at ISTE. Staying in a 3 bedroom, 3.5 bathroom townhouse provides plenty of sleeping and meeting space for a group of 4. Each year we notice a growing number of educator walking between Vista Cay and the convention centre. On the walk this year we encountered a couple of teachers from Saskatchewan that noted that there were part of a group of 30 people from their school district staying at Vista Cay while attending the conference. A review of my past credit card statements reveals that the cost of registration, travel and accommodations for FETC is often less than my hotel bill at ISTE.